The May addition to the GRAVE DANCE excerpt has now been posted! Click here to read it. I'll be extending the excerpt one more time (in mid-June) and then the book will hit shelves on July 5th. I can't believe we are just over a month and a half from release. In the coming weeks I should have information about blog tours, release parties, and signings, so please stay tuned. Happy hump-day everyone, and remember to check back later this week for an author chat with Mario Acevedo and clips from last weekend's SC Book Festival. I'm very happy to unveil my very first foreign cover. 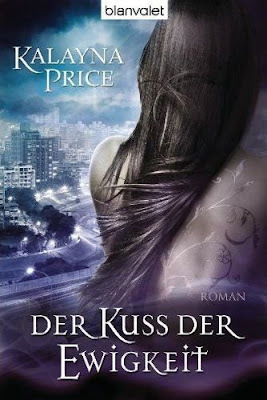 This is the German version of ONCE BITTEN (German title appears to be "The Kiss of Eternity") and I am just floored by how beautiful it is. I will have to figure out how to get my hands on one when it hits shelves this December. Happy Tuesday everyone! I should have an extended excerpt up tomorrow and videos from the last weekend's SC Book Festival later this week, so check back soon. First of all, I want to say thank you everyone who entered! It was awesome to read how you found the books. I wish I could send all of you ARCs! dorien-b who wrote "I believe I found the cover of Grave Witch on All Things Urban Fantasy and kept it in the back of my mind. It was a great cover and the blurb had caught my attention, so when release month came I noticed the cover again." Congratulations Dorien-b! Please send your shipping information to contests(AT)kalayna(DOT)com and I'll sign the ARC and ship it out to you. To everyone else, thank you again for entering! If you didn't win this time, please check back because I'll be having another contest closer to the release of the book.